You have decided to sell your crystal - great! We try to make it simple. First, we know you are anxious to find out how much cash we will pay you for your crystal. It is important to know that we are not crystal collectors. We provide a wholesale price for your crystal pieces. First, check out " What we Buy ". This page outlines our guidelines regarding what type of crystal we will purchase. It also includes picture of logos you should look for on the bottom of your items. 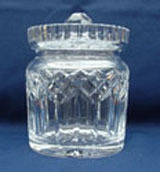 We will consider other types of crystal if the crystal fits our business model. A common problem may be that you believe you have some fine crystal, but are not sure what type you have. The first step for you is to look at the bottom of the piece to see if there are any manufacture name or logos. If you don't find any chances are we may not be interested. 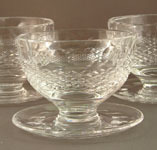 Depression glass has identify manufacturer names about 20% of the time. If you're not sure of what you have, Email us a picture of your crystal. PLEASE DO NOT TEXT US A PICTURE. We should be able to determine the manufacturer and the specific pattern. If you know what type of crystal you have, send us an email or call us with the manufacturer, pattern, and how many pieces you have of each type. 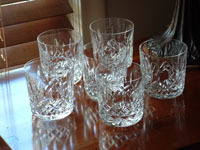 If it's stemware, a vase, or a decanter, please include the height of the pieces. If it's a bowl, include the height and the diameter at the rim. Please use a ruler to confirm your measurements. Please let us know if it is new in a box, how you acquired it, and what condition it is in. Remember, you should only hand wash your crystal. It isn't necessary to wash the crystal you send to us. 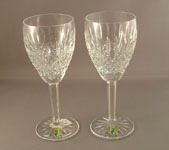 If you received a quote from us and want to send us your crystal for final inspection and potential purchase - Great! 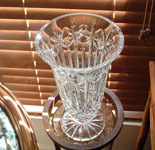 Please ship your crystal INSURED by U.S. Mail Parcel Post. DO NOT use priority unless it's the same as standard post, do not ship UPS or FEDEX or overnight mail. Shipping Your Crystal: When we buy your crystal, we will cover the cost of shipping your crystal to us from anywhere in the continental United States. If you've never shipped crystal before, don't panic. We provide guidelines for how to ship your crystal safely. We send these guidelines upon acceptance of our offer. Pick-Up of Your Crystal: If it fits our business model, we will pick up your crystal. This may include sending out our crystal tanks to pick them up. There is a small fee for this. For larger collections, we will travel to pick-up your collection depending on quanity and value. Crystal Damaged During Shipping: If we receive broken crystal pieces from you, we will notify you immediately, and let you decide if you want to pursue a claim or not. We will email you the USPS (United States Postal Service, i.e., U.S. Mail) guidelines which provide you with their guidelines on how to file a claim. Filing a damaged claim is an involved process, so we recommend packing your crystal very carefully. We have to keep the box it came in if you decide to make a claim. This is the fun and rewarding part. We can pay you by Cash ( where possible ), a Certified Check ( there is a $10.00 fee ), or by a company check after you crystal has been inspected. Simply let us know your preference.